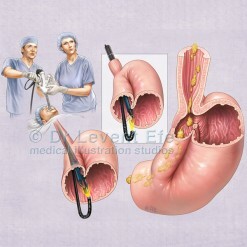 Doctor performing an endoscopy (Gastroscopy) examination of the stomach and duodenum. 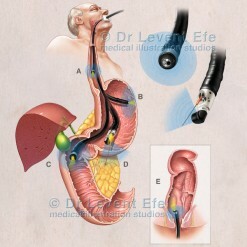 A. Gastroscopy involves inserting a flexible fibre-optic viewing tube (endoscope) down into the oesophagus, stomach and sometimes duodenum. B. 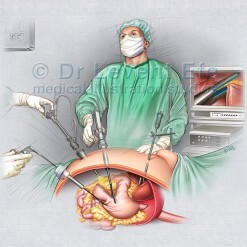 The procedure is done for diagnosis of stomach ulcers or tumours, as well as taking a sample of tissue (a biopsy). Gastritis is visible in the antrum. C. Deep gastric ulcer eroding layers of the stomach. SKU: GIT7. 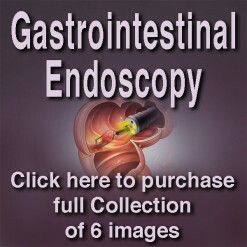 Categories: Gastrointestinal (GIT), Gastrointestinal Endoscopy. 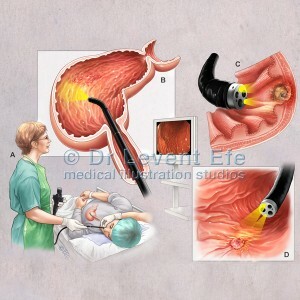 Tags: alimentarycanal, bacterial, biopsy, cancer, condition, diagnosis, diagnostic, diagnostics, digestive system, disease, disorder, duodenal, duodenal wall, duodenum, endoscope, endoscopic, endoscopic view, endoscopy, endoskopi, fibre optics, gastric, gastritis, gastroenterology, gastrointestinal, gastroscope, gastroscopic, gastroscopy, gastroskopi, h pylori, healthcare, helicobacter pylori, human, human body, infected, infection, inflamed, inflammation, internal, lining, medical, medicine, mide, mide kanseri, mide ülseri, monitor, mucosa, polyp, small intestine, stomach, surgery, technique, ulcer, unhealthy.